Looking for a new gaming chair? This is our review of the EWin Calling Series! Variety of uses, including office chair, gaming chair, etc. If you spend a lot of time in sitting, we think that this is a good chair for you. Whether you work long hours, are trying to improve your posture and overall health, or you stay up all night playing World of Warcraft, this chair is going to change your life. We love how adjustable it is, which helps it to be much more comfortable overall, for anyone. We realize that it has a hefty price tag, but we think it’s worth it if you sit a lot. If you have a desk job, chances are you have an office chair. Most Americans work an eight-hour work day, which means you could be spending up to eight hours a day in that chair. Quick question—are you comfortable in this chair? Are you sitting properly with good posture? Turns out, most people aren’t, but you can fix this pretty much instantly. 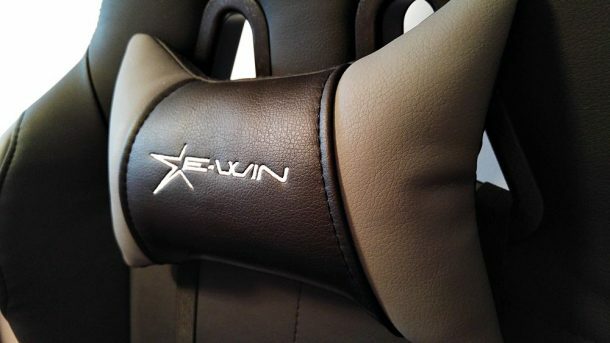 In this review we discuss the EWin Racing Calling Series Gaming Chair that the company sent us to check out. Don’t get us wrong, we realize you might have some sticker shock when you see the price of this chair. It’s $359 before any sales, but as of this post, it’s currently on sale for $259. Before you write this chair off completely because of the price, remember the health and comfort benefits that it offers. Maintaining proper posture while you sit can improve circulation, improve breathing efficiency, and overall oxygen supply to the brain, heart, and other vital organs. Think of it like the organic vegtables at the grocery store: they’re expensive, but probably better for you in the long run. And to be honest, for gaming chairs, it’s not actually egregiously priced. They also make plenty of other gaming chairs. Basically, EWin created this chair to give the user complete control over customizing it, so that they can reach maximum comfort. The base of the chair is a steel metal frame, with a dense memory foam molding on top. The chair doesn’t really feel like memory foam to us though, it just feels like dense foam because it has fast responsiveness. The chair is then supported on a nylon five star base that rolls around on wheels, and has support pillows for the neck and lower back that are attached by elastic straps. The pillows can also be removed if you wish. This chair can support up to 330 lb. Now let’s get into all these customizable features we keep promising you. First, the armrests can be lifted and lowered. This is important to make sure that you’re not scrunching your shoulders up to use the arm rest. The overall chair is also adjustable, letting you adjust to where you can comfortably lay both feet on the ground. We found that most of the guys in the office could accomplish this, but Kaite Kale who is five-foot-nothing couldn’t make the chair short enough to be comfortable, so we don’t recommend this chair for those who are 5’ tall or under. The back is lever operated between 85 degrees to 115 degrees. If you want to be awake and alert, set this chair all the way upright, and if you want to take a nap, lay it all the way down. We think gamers will really like this ability to recline to their comfort. On top of that, you can lock the seat of the chair with the “tilt lock” so you can tilt both the back of the chair and the seat of the chair back together. Besides all that, you can further customize this chair with your favorite color. It’s available in accent colors of black, grey, red, orange, yellow, lime green, blue, brown, light pink, and white. This is definitely an office favorite around RIZKNOWS. In fact, we might have to make a rotation chart in the office among the guys because they keep fighting over who gets to use it. It’s incredibly comfortable and even though we have all different sizes of people in the office, it can fit each and every one (besides Kaite) because it is so adjustable in so many ways. We think it’s definitely a luxury expense, but if you’re someone who sits for the majority of the day during work or play, we suggest this chair to you. Note: This is a review post from RIZKNOWS. I’m not a young gamer anymore. What does this mean? Well, among other things, it means that lower back pain, middle back pain, upper back pain – all of them are no strangers to me. That’s what happens when you spend several hours each day in a chair playing computer games and writing about that. In a crappy chair, I might add. Boy, if only I would’ve known about the EwinRacing gaming chair before! I’m sure that my back would’ve felt a lot better. I would’ve killed countless more enemies because of a better posture, because I would’ve felt so much more comfortable. But at least I’m righting the wrongs now – better late than never. Because, yes, I now am the proud owner of a professionally made gaming chair: the Ewin Calling Series Ergonomic Computer Gaming Office Chair with Pillows. A long name, but it’s worth memorizing it, because it’s the name of quality and comfort. And today I’m going to share with you my EwinRacing Calling Series gaming chair review. I’ll be very honest with you: I’m not extremely skilled when it comes to manual labor. I can craft the most amazing structures in my games and I’ve built a base in Fallout 4 that the entire Wasteland envies. But when it comes to using tools and building stuff in real life, I am completely clueless. When I saw the pile of stuff that was supposed to be me gaming chair, I was scared. I was sure that I’ll do something terribly wrong and I will destroy an otherwise great product. But I had no choice. I had to put on my armor (a pair of white gloves, in this case – included in the chair’s package) and get to work! Assembling the Ewin Racing Calling Series gaming chair proved to be extremely easy, fortunately. Maybe I got a boost in skill from the magical gloves or maybe it was the extremely helpful instructions manual that took me through all the steps clearly, but I managed to do it! That pile of scary materials quickly turned into a chair. It took me at most 30 minutes to completely assemble the Ewin gaming chair and I am sure that gamers of a slightly higher level than mine will be able to cruise through this stage in 15 minutes tops. But I was satisfied with my half an hour as well, especially since the final product looked soooo good! If you are like me and rested your buns on crappy chairs during your entire life, you’ll be thrilled to look at the Ewin Racing Calling Series gaming chair. It’s enough to just look at it and you’ll understand how comfortable it is. And there are multiple color options if you don’t like the sober, black & gray touches I went with. It’s built of faux leather which still looks very durable and is extremely comfortable and smooth to the touch. It’s heavy and sturdy, meaning that it will hold you in place even during the most intense on-screen battles. It comes with two pillows – which I consider the cherry on top, the frosting on the cake: one for better lumbar support and a headrest, which are a must if you’re spending hours on a chair, working or playing games. Trust me – you might not feel the pain now that you’re young, but as years will pass by, it will get more and more difficult. The pillows can be completely removed if you want to (but I wouldn’t recommend that) and you can easily adjust their height. The upper pillow is giving me a bit of trouble as it refuses to stay in one place and always seems to be lower than I’d like it to be, so it has to be adjusted regularly. Not a big problem, in the end and it’s definitely worth the few seconds when it comes to feeling so good. But it’s not just the pillows that are built to help increase comfort. The steel frame itself (dressed in high density memory foam) is designed to mold around your body. This means that you’ll still feel comfortable even after hours of sitting on this chair. And to make things complete, the armrests can also be adjusted vertically. Another nice feature is the chair’s option to recline all the way to 155 degrees. This is a very comfortable position for watching movies or whatever, taking a nap during those long raids or chilling with a controller in hand, if you really do that on your PC (since I wrote about console chair options otherwise!). I haven’t really used this much, but it’s good to know about it and I’ll sure put it to good use if the opportunity arises. I still remember the moment I sat down on this amazing gaming chair created by Ewin. My whole body instantly felt the difference and especially my lower back was shouting with joy. The Ewin Calling Series gaming chair is extremely comfortable and a great deal for the price. Even at the end of the day, I still feel great and I am sure it will help improve my back pain over time. A great product selling at a great price. You really have no reasons to complain about it! NOTE: This is a review post from Unigamesity. 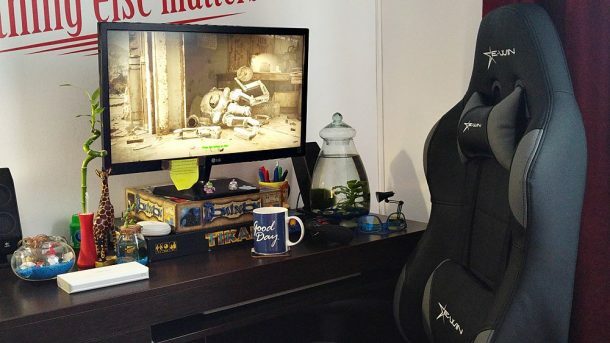 Whether you’re gaming, working from home or sitting in an office, you might find yourself spending a stupid amount of time in a chair at a desk. I am one such person. Having previously worked in an office, and now working from home, I spend pretty much all of my time at my desk. I never really considered how important a chair could be, until I received the E-Win Racing ‘Calling’ gaming chair. There are dozens of chairs like it on the market, but E-Win’s is the first I’ve used that has both adjustable lumbar support for your lower back and a headrest. 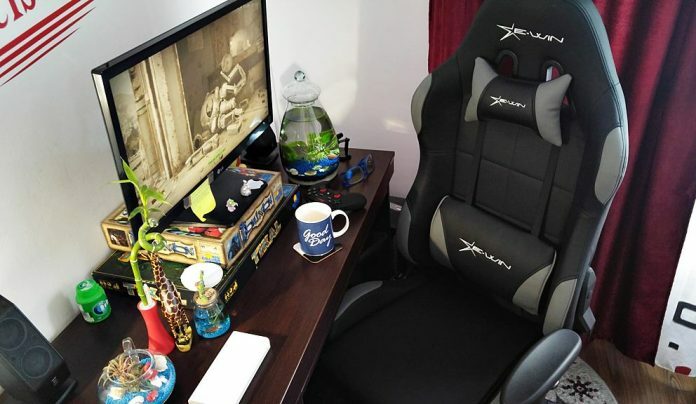 It’s this combination of features that make it an excellent chair, whether you’re planning to use it for long gaming sessions, office work, or just relaxing and watching TV. The E-Win gaming chair is a self-assembled design and is built for durability and comfort. It’s adjustable in various ways, and costs around $329 (it’s currently on sale on Amazon for $229), though there are various models available. I love the fact that the E-Win chair’s frame is made of metal. This is a chair that will last a long time, and you can really feel it from the five-point base all the way up to the frame of the seat itself, which is cushioned generously in textured synthetic leather with thick foam. If you’ve found yourself prone to breaking cheaper plastic chairs, this is just what the chiropractor ordered. The armrests are adjustable in height, which is a nice addition for supporting different gamers’ needs. But perhaps the best thing, my favorite thing, about it is the lumbar back support cushion. The cushion is held in place with straps, and it can be slid up and down at will. I cannot possibly emphasize how much better it is to have this cushion in place, and I struggle to understand how I spent the last 10 years working at a desk without using one. Still, if it’s not your bag, it can also be removed entirely – a nice bonus if you were planning to recline further back in this chair. For seated configurations, it’s simply wonderful. Unlike some other chairs I’ve used, E-Win’s uses synthetic leather instead of fabric. PU leather is less prone to wear than fabric, and while it’s not as strong as genuine leather, it is significantly cheaper. The synth leather is also far easier to clean and wipe down than fabric-based chairs might be, and its general thickness really gives a strong impression of durability. I honestly don’t have a single thing to complain about with this chair. Even the synth leather, which I expected to be clammy under hot conditions, has been surprisingly airy, even in baking 95-degree F AC-less summer heat in South Germany. As a dude who spends the majority of his time at a desk, finding a decent chair has always been a bit of a struggle for me. I’ve always opted to go low-end and pick up something for around $100, only to regret it a few weeks later as the damn thing fell apart or started hurting my back. I always just made do, but now that I work from home, it has become even more necessary for me to take something as basic as sitting more seriously. That’s what the E-Win range seems to represent: serious sitting. Using high-quality materials, metal frames, and tons of adjustable features and complimentary neck and lumbar support, I feel like the price of $329 (before any sales) is incredibly reasonable. E-Win has made me take chairs a lot more seriously. If you’re in the market for something more comfortable for gaming or office work, you honestly need look no further. Buy this chair. You won’t regret it. NOTE: This is a review post from Windowscentral. The E Win Racing Calling Series gaming chair costs a little less than the Champion Series, whilst also offering less variety of colour options. The Calling Series retails at a RRP of €359 EU / £319 UK / $431 US, although it is currently on sale for €229 EU / £204 UK / $275 US, and you can knock off an extra 15% off with our voucher code ‘consolemonster’. I’ve seen chairs costing much more than this and still have less features and quality. So on paper, the E Win Racing gaming chairs seems a bit of a bargain! Setting up the Calling Series chair was very simple. The two hex/allen keys included are all that’s required to assemble the chair. The helpful photo guide lists all the necessary steps needed to assemble it, and with most of the chair being mostly pre-assembled you just need to unscrew a few pre-fitted screws, attach the back rest to the seat portion, screw the base plate onto the seat, attached the wheels and insert the rising piston, then finally place everything onto the wheel base, and after just 25 minutes, voila, you’re done! Just like the Champion Series, the Calling Series uses some good quality parts and materials, with the only let down being the plastic arms. There are many buttons, leavers and switches to help achieve maximum sitting comfort here, however there are slightly less features than the closely-priced Champion Series. It’s important that the seat has a good amount of padding to it. There is nothing worse then having a thinly padded seat that last barely a year before you begin to feel the framework inside. Thanks to its fairly thick padding of 8 cm, the Calling Series will be supporting your derrière for a long time. The seat’s width is slightly narrower and the side padding is less diagonal than the Championship Series, so if you have a habit of sitting on your crossed-leg, the Calling Series makes this a little more restrictive and uncomfortable to do. Like the seat, the back support is just as important, and thankfully the Calling Series caters very well in this department too. Although this Calling Series has a slightly smaller frame, just like the Champion Series, the back rest dominates this chair’s overall form factor. I was hoping for a slightly more low profile chair than the Champion Series, but sadly when comparing the two, I saw very little difference in both models. Adjusting the back position is simply done by pulling on the right side leaver, that is located where the backrest meets the seat. The seat hinges have some fairly strong springs, so the backrest can jump forward fairly rapid if you’re not leaning back on it. Adding a little more pressure whilst leaning back moves the back of the seat backwards very easy, and as you keep leaning back you soon start to notice one of the chair’s key features – the ability to move the back almost fully horizontal! Great for that power nap or brief rest. Very popular with gaming chairs these days are the lumber and head cushions. These are held on by a pair of elasticated straps and plastic buckle clips. The straps come pre-fitted, wrapped around holes located in the bottom and neck area of the back seat. The lumber cushion alone made a huge difference to my sitting experience; the neck cushion however, probably not so much. Whilst the chair is more reclined, I can see the neck cushion having more of a purpose. Like the Champion Series, the straps could be a little tighter too, or at least hold the cushions in their adjusted position, because I found the bottom lumber support always required adjustment every time I sat back into the chair. On either side of the seat you’ll find the plastic arm rests. Just like most chairs, each arm-rest can be raised and lowered to your own preference. For me, I wish they could go a little more lower than these currently allow. Unlike the Champion Series, this is where the armrest features end for the Calling Series. So if you require many armrest adjustments, you should maybe consider the Champion Series instead. Each arm comes pre-bolted to the seat, however if you prefer, these can be unscrewed and remove them entirely. After two weeks using the Calling Series, I found the general build quality maintained the same very sturdy and solid impression that I got when I first sat in the chair, so much so that I can imagine this chair would serve me well for many years. The pleather material used in the seating appears to be of a high quality, and it doesn’t look like it will flake-off for some time. The cushions and the firm seat padding feels like they contain a good quality and density of foam that should take the weight and reshape themselves after use for many sittings. Once again though, I my only gripe mirrors the same issue I had with the Champion Series, and that’s with its general style. In a small office environment, the back of the chair can look almost monolithic. It was commented to me the other day that someone couldn’t tell if I was in the chair when viewing from the back. For me, the size of the back seat could be much smaller. Any portion of the seat from my neck upwards do not touch, so it feels all this area could all be trimmed down. At 5’8” I also found that my feet would leave the floor when I adjusted the seat to the correct height for my desk height (a standard 72 cm high), and this meant that I had to use a foot rest underneath in order to maintain a decent circulation to my feet and legs. If E Win Racing took these same materials and build quality, and created a more smaller backed gaming chair, that would make THE perfect chair for me. Perhaps their Flash Series could indeed tick that box, and I hope I can sample that chair also soon. There is very little price difference separating both the Champion and Calling series of gaming chairs, so if you can live without the additional armrest features, you can save a little on the Calling Series. But because there is very little difference in size, the extra colour options and extra armrest features make the Champion Series a slightly better option for your money. NOTE: This is reprinted from Consolemonster.